Teaching about ancient Egypt has never been easier – a quick Google search for Ancient Egypt lesson plans yields millions of results. A teacher can also look at TeachersPayTeachers and find over 3,200 resources to buy and use. It’s easy to understand why – ancient Egypt is a fascinating topic that is taught in every World History curriculum. What person (both student and adult) doesn’t like to learn about mummification and pulling brains through the nose? Therefore, while ANOTHER list of Egypt resources might not be necessary, let’s talk about how to use the amazing technology we have to bring this ancient civilization to life. One of the leaders in educational VR lesson plans is Nearpod. They have their own VR headsets included with a purchase of class sets of their produce. The virtual field trips they offer include the Washington Monument, Great Wall of China, the Taj Mahal and the Great Pyramids of Giza. In the Egyptian lesson, students explore the Tomb of Ramesses VI and learn about hieroglyphics. Another great option is the British Museum as they hold the largest collection of Egyptian artifacts outside of Egypt. The museum has done a great job of putting their entire collection online where you can search the artifacts, and they recently made their entire Egyptian Exhibit a 360 experience! Students are able to walk through the exhibit and explore the artifacts. Check out vr.britishmuseum.org for more information. Describing Egypt is a wonderful website that is being developed to tell the story of Egypt’s long and interesting past. 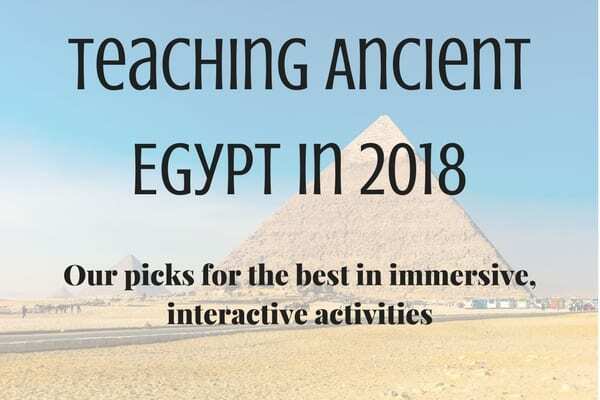 Right now, they have seven different tours focusing on the tombs of the 30 Dynasties era – making it possible to walk through the tombs and temples of some of the most important sites in ancient Egypt. Discovering Egypt is a website by Mark Millmore who is an artist with an intense interest in Egyptology. He has developed incredible 3D renderings of the temples of Egypt. They are also available as an iPad app. He even has an Egyptian hieroglyphic typewriter that students will love to play around with. If you are looking for an interactive experience where your student becomes the archaeologist, look no further than our Excavate! Egypt. Students have the option to travel to four important locations along the Nile. 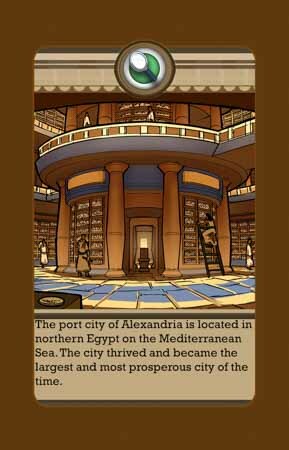 In Alexandria players will learn about the importance of education and trade in the Great Library. In Karnak players explore the great Temple of Karnak and understand the power of the Pharaoh. In Giza players gain an understanding of the people who built the Pyramids by exploring the worker’s village. In Valley of the Kings players discover tools and items used in mummification and the tombs of the Pharaohs. In each site, players use virtual archaeology tools to dig for artifacts. Once uncovered, players move to the analysis tent where they answer multiple choice questions that force them to look closely at the artifact. Finally, players are asked to gather their new information together in a field report to summarize what they’ve found. In addition to the video game, we have created the Excavate! Card Game. Players must use their knowledge of the people, artifacts, and locations of Egypt to make connections. It’s a fun way to let students use their creativity and show what they really know. Check it out here! We hope this list provided some fresh inspiration for your unit on Ancient Egypt. We’d love to hear about any other cool tools your use! Today, Dig-iT! 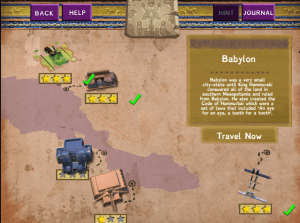 Games formally announces the expansion and updated improvements to the Excavate social studies games series with six civilizations on world history. Existing civilizations Egypt, Mesopotamia and MesoAmerica have been updated with additional content and C3-aligned gameplay for an enriched overall learning experience. New civilizations include Rome, Greece and Byzantine (coming soon). Available on multiple platforms for desktops, tablets and phones, these games are designed by former middle school teacher and DIG-IT! Games CEO, Suzi Wilczynski, to take kids on archaeological adventures through time and around the world, that are both entertaining and educational. The series has also been expanded to include Excavate! playing cards for classroom and family fun. Each card deck includes People, Places and Artifacts cards that complement the video game or can be played separately. This is a perfect way to get the conversation going without screen time. An excellent gift option for your child, grandchild or a favorite teacher to introduce the ancient cultures. Game decks are available for the Rome and Egypt civilizations. Standard game play is for 3 to 5 players ages 9 and above. “We are pleased to be adding three new world history civilizations to this popular series and updating the content to align to C3 standards to make a more effective teaching tool” says Wilczynski. “Excavate™ provides a high-quality resource for educators across their full World History Curriculum and the new card decks add an additional option for cultural game play, creating a complete multi-media game experience for the middle-school classroom. Looking for resources to teach your Ancient Civilization course? 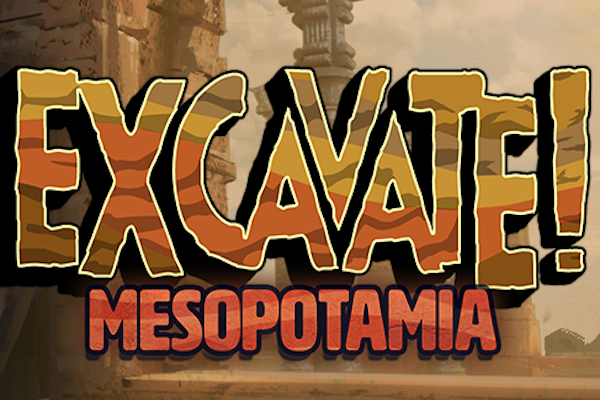 We are happy to present the newest game of our Excavate Series; Excavate! Mesopotamia. 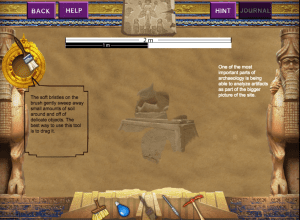 This game will engage learners with a simulation of an archaeological dig. Kids and adults will have fun exploring the sites of Ancient Mesopotamia and examining artifacts left behind by the people who lived there. 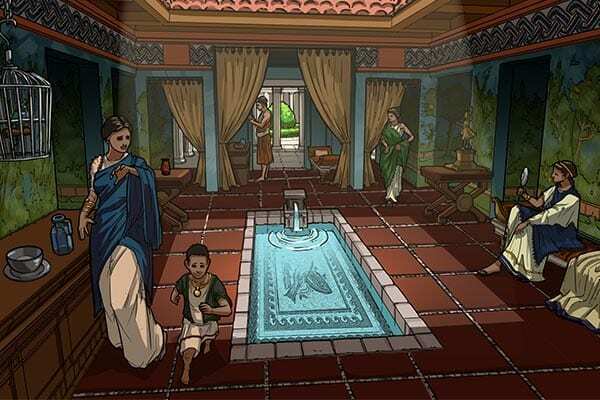 Mesopotamia means “the land between rivers” and this interactive game takes players through five different sites in Mesopotamia: Ur, Nineveh, Persepolis, Babylon, and Nimrud. Students discover the important historical figures, technological advances, and the important buildings from each of the locations. All information is found in the student’s journal which can be accessed at any point in the game. Players choose the correct tool such as a sieve, pick, brush, or trowel. Each tool is explained, but be careful! If you use the wrong tool you might break or lose the artifact! Click or drag the tool around the pit to uncover an artifact from the area. Fun facts about archaeology can be found while you are digging. Students can learn more about stratigraphy, tools, and soil while they are playing. Students analyze each artifact by answering a series of multiple choice questions about the material, location, and function. If they are successful in completing all of the artifacts, the next location will unlock. Students are able to access all of the information about the artifacts by returning to their journal and reading about them. 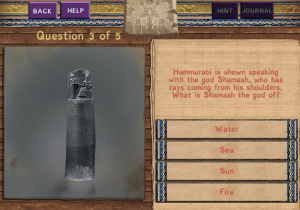 Example of artifacts included in the game are: The Royal Game of Ur, Stele of Hammurabi, the Tablets of the Epic of Gilgamesh, and a statue of Penelope from Persepolis. This is the perfect game to introduce basic archaeology and artifact analysis. It’s great to play individually or as a class to discuss culturally relevant objects from these ancient lands. Students are able to explore and take ownership of their own learning because they can also play at home and bring back information for class. Use this game along with Excavate! Mesoamerica and Egypt to let students compare and contrast each civilization and their artifacts. This could be a great lesson when discussing where people settled and the tools they used and why. Look out for more locations to come! Let us hear your thoughts! Find the game here. Have an idea for an ancient civilization that you can’t find enough resources about? We’d love to hear what you’d like to see in a game! Send us an email or contact us on Twitter or Facebook to let us know what you think! Check out the full press release here. Click HERE to sign up for our Educators Newsletter! Click HERE to join our Game Creators Club! A creative game studio that builds award-winning games users really dig!